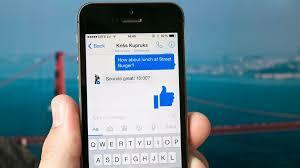 Facebook is testing voice commands for chat and calls in its Messenger platform. Facebook recently was attacked by hackers who invaded the system and hacked man users accounts. However, Facebook has reported that over 90 million accounts which have hacked have been restored thereby urging Facebook users to ensure that their accounts are well secured by having a strong password. Facebook messaged manager spokesman confirmed that Facebook is currently working on the test when properly confirmed it will be published. According to the Spokesman, “We often experiment with new experiences on Messenger with employees. We have nothing more to share at this time,” the spokesperson was quoted as saying. Voice control could make Messenger simpler to use hands-free. “Facebook Messenger is eager to differentiate itself from SMS, Snapchat, Android Messages and other texting platforms,” said the report.